The 66-year-old Nobel Peace laureate traveled for the first time in two decades to the Irrawaddy Delta, Myanmar's rice bowl and the region most devastated by Cyclone Nargis in 2008. 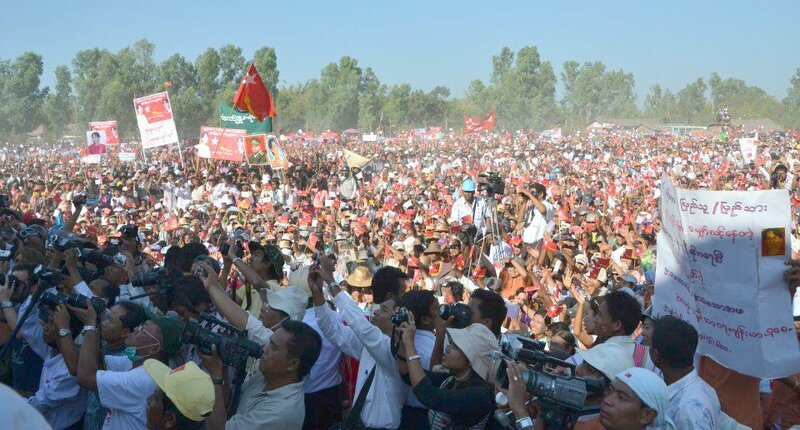 Crowds lined the roads to shout support to Suu Kyi at every major town along her four-hour drive south from Yangon to Pathein, the regional capital. More than 10,000 people packed into a sports stadium under a sweltering sun to hear her speak. A later rally in an open field in the town of Myaungmya, 19 miles (32 kilometers) south of Pathein, drew a similar-sized crowd, and held special personal meaning for Suu Kyi. "I am happy to be here because it is the hometown of my mother," she told the crowd. "There is some blood of Myaungmya in me." Suu Kyi, who had been living abroad after graduating from Britain's Oxford University, became enmeshed in Myanmar's politics when she came home to care for her ailing mother, Khin Kyi, as mass pro-democracy protests were breaking out in 1988. 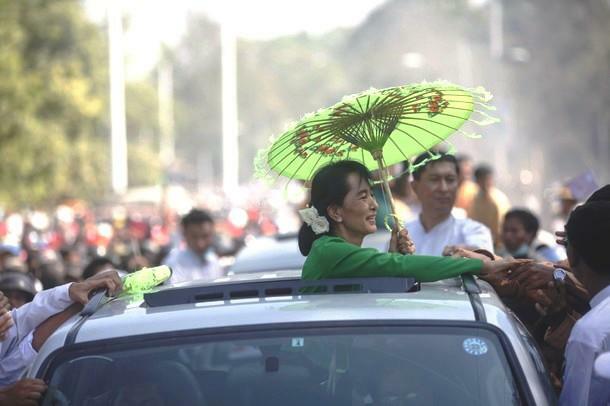 Suu Kyi's return to electoral politics is another test of the reforms of the new nominally civilian government that took power last year after decades of military control. Her latest trip came a day after the Election Commission formally accepted her candidacy for an April parliamentary by-election. 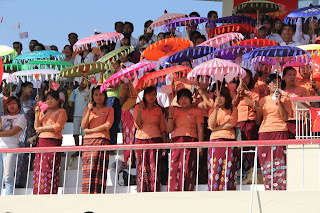 Suu Kyi last visited the Irrawaddy region during a campaign tour in 1989, when she faced down soldiers in the town of Danuphyu who had taken firing positions with their rifles aimed at her. It was one of several dramatic confrontations with the ruling military junta ahead of 1990 elections, which Suu Kyi's party won but the junta refused to recognize. 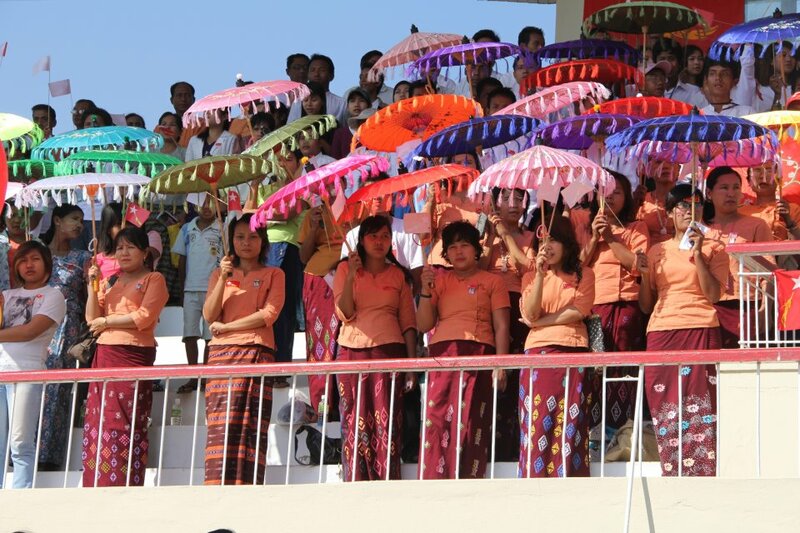 "Those who are standing in the front rows please sit down so other people can see," Suu Kyi said at one point. Suddenly, thousands of people sat down in unison. Suu Kyi is running for a seat representing Kawhmu, a poor district south of Yangon, the country's largest city, but has launched a national campaign to lobby support for other members of her party. On Monday, the U.S. eased one of its many sanctions as a reward for Myanmar's progress. Secretary of State Hillary Rodham Clinton signed a waiver that should make it easier for Myanmar to secure help from the World Bank and other international financial institutions by lifting U.S. opposition to them conducting assessments.